January marked our thirtieth event, held on the 30th day of the month. Our theme, of course, was “thirty”: music with a link to the number 30. Maybe it would be a 30-year-old album, an album with 30 performers, a record with 30 songs or an album released by a 30 year old. However tenuous the connection, we wanted to hear things related to the number 30. Our album was celebrating its 30th anniversary this year: “Paul’s Boutique”, the cult Beastie Boys album. We were hosted by Rob Lindsay, a “Social Media-er and adopted Brummie”, who is easily distracted by musical rabbit holes. Rob is a huge fan of sampling and turntablism (as evidenced by his previous OTR hosting effort with the Avalanches back in 2017) and will play Lou Bega to anyone at any opportunity. 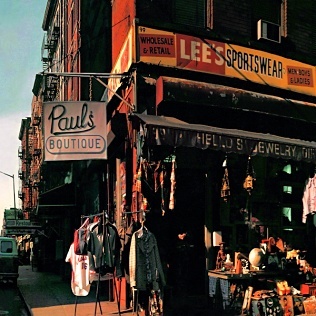 Paul’s Boutique is famed for its groundbreaking use of samples and its cult status amongst hip-hop fans despite the record label’s disapproval at the time, and about two thirds of the audience had already heard the record. We settled down to listen to just under an hour of samples, lengthy rhymes (10+ pages of lyrics! ), genre mixing and wordplay. Reception afterwards was fairly mixed: most people commented favourably on the Beasties’ efforts to distance themselves from the fratboy rap of their debut, but equally it felt like some of the tracks felt a little dated and not very “woke” in 2019, despite the album’s groundbreaking, progressive reputation. People commented on the density of the beats, sometimes wishing for a less layered backing so the words could stand out more. Some folks praised the lengthy closing track for its lo-fi, raw feel, but others felt the album could’ve ended without it and not suffered. Words used to describe the album included “boisterous” and “brash”, “juvenile” and “chaotic”, “coherent” and “eclectic”, and a plain-ol “meh”. The average score was 6.6 / 10. Special thanks to William for bringing along a copy of a Birmingham music zine published 30 years ago in 1989 – a few of the acts mentioned were still around today (possibly). Thanks to Rob for hosting! See above to see who nominated each song which matched our theme, "Thirty".